The NH-L9a is a premium quality quiet CPU cooler for AMD based HTPCs and Small Form Factor systems. At a super-low profile of only 37mm, the NH-L9a is ideal for extremely slim cases and due to its 92x114mm footprint, it provides excellent compatibility with tall RAM modules and other components on mini-ITX mainboards. The custom designed SecuFirm2™ mounting system for AM3+/FM1/FM2/FM2+ makes installation a child’s play and thanks to the highly optimised NF-A9x14 premium fan that supports fully automatic speed control via PWM, the NH-L9a runs remarkably quiet. Topped off with Noctua’s renowned NT-H1 thermal compound, the NH-L9a fuses everything users have come to expect from Noctua’s larger coolers into a super-compact package for slim HTPC systems. The NH-L9a is a highly-compact low-profile quiet cooler designed for use in small form factor cases and HTPC environments. While it provides first rate performance in its class, it is not suitable for overclocking and only recommended for CPUs with up to 65W TDP (Thermal Design Power). Please consult our CPU compatibility list and TDP guidelines to find out whether the NH-L9a is recommended for your CPU. Some AMD based mini-ITX motherboards have the PCIe slot sitting close to the 96x114mm socket zone. While larger coolers that exceed this zone may block the PCIe slot, the 92x114mm sized NH-L9a provides full compatibility with PCIe cards. The highly optimised NF-A9x14 premium fan features Noctua's proprietary AAO frame as well as sophisticated aerodynamic design measures. Supporting PWM for fully automatic speed control, the NF-A9x14 allows the NH-L9a to stay remarkably quiet. Allowing to reduce the maximum speed of the NF-A9x14 fan from 2500 to 1800rpm, the included (L.N.A.) makes it possible to achieve near-silent setups using CPUs with less than 65W TDP. 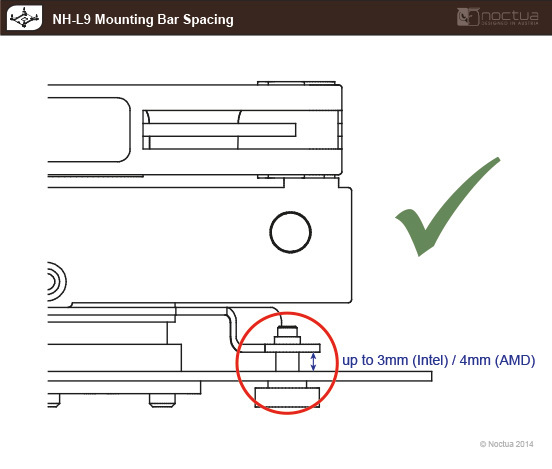 The NH-L9a bundles a custom-designed SecuFirm2™ mounting system for AM2(+)/AM3(+)/FM1/FM2/FM2+ that offers extended compatibility with mini-ITX boards and makes installation easier than ever, all while maintaining the trusted SecuFirm2™ quality. The Noctua NH-L9a low profile AMD CPU cooler may be small, but it definitely isn't weak. During testing it easily outperformed the stock cooler it replaced in terms of cooling power and noise production. When compared to another, larger cooler cooler from Noctua it didn't come out on top, but it did fare well. Even without the Low Noise Adapter included in the package, the cooler was extremely quiet while keeping the CPU operating at safe temperatures. In addition to the performance and near silence, the NH-L9a was extremely easy to install. The whole process took less than 5 minutes and I would have to agree with the description of the installation found on the Noctua site where they call it 'child's play'. Para que nuestro procesador este en una banda aceptable de temperatura a carga maxima tenemos que forzar al ventilador del NH-L9a a trabajar a una frecuencia de unas 1600rpm donde produce menos de 20dBA. Buenos resultados si tenemos en cuenta que estamos con un procesador que va al límite de su capacidad de refrigeración pero que a su vez nos ofrece una gráfica de calidad y una CPU de cuatro núcleos con una frecuencia elevada. Le NH-L9a joue son rôle à merveille, car même avec un processeur hors gabarit pour lui, température et bruit ne sont pas excessifs, ils seront toujours inférieur au ventirad d'origine. Le NH-L9a, dernier né de la famille des ventirads du constructeur autrichien Noctua, débarque directement dans la cour des grands. Si toutes les configurations ne peuvent pas être supportées par ce ventirad, ce dernier s'avère être un allié de choix pour les configurations dites de station vidéo/home cinéma dans des boitiers au format « mini tour ». Noctua hat mit dem NH-L9 einen Low Profile CPU-Kühler auf den Markt gebracht, der seines gleichen sucht. Die Verarbeitung und der Lieferumfang lässt keine Wünsche offen. Die Verarbeitung des Kühlers ist sehr sauber, es gibt keine scharfe Kanten. Der Boden des Kühlers ist plan und frei von Rillen. Der Lüfter ist sehr kompakt und dank seines Rahmen noch zusätzlich entkoppelt. Zudem hat man das 20 cm lange Anschlusskabel mit PWM Stecker noch mit einem schwarzen Sleeve versehen. Beim Lieferumfang ist alles dabei was man benötigt. Neben einer High-End Wärmeleitpaste liegt noch ein sehr edles Case-Badge aus Metall mit bei. Die Montage des Kühler ist sehr einfach gehalten, auch kommt dieser nicht mit dem RAM oder der Grafikkarte in die Quere. Sieht man sich das Verhältnis aus Lautstärke und Kühlleistung an, so kann man den Boxed Kühler des CPU Herstellers getrost bei Seite legen. Auch hat der Test gezeigt das trotz maximaler 65 Watt TDP der NH-L9a eine CPU mit 95 Watt TDP gut kühlen kann. Hier kam die CPU beim offenen Testaufbau nicht über 42°C laut CoreTemp. Wie man den beiden Testergebnissen entnehmen kann, eignet sich der Kühler bestens um ein solches System zu kühlen. Mit dem Boxed Kühler war der Lasttest nicht bis zum Ende möglich. Die CPU erreichte nach ca. 10 Minuten eine Temperatur von 69°C und das System schaltete sich ab. Der Reeven Kühler bewältigte die Situation schon besser, musste sich jedoch um Längen von dem NH-L9a schlagen lassen. Der Noctua Kühler verrichtete seine Arbeit nicht nur etwas leiser, sondern auch bedeutend effizienter. Como conclusión, después de realizar las pruebas de rendimiento, podemos decir que este disipador cumple con su cometido en procesadores de gama media o baja y sin OC, además de tener un perfil bastante bajo, mejorando aún más la colocación en torres de reducidas dimensiones. En cuanto a los accesorios que trae, como estamos habituados, Noctua incorpora un completo juego para mejorar la conectividad del disipador con la placa base, además de traer la pasta térmica y un reductor de ruido, entre otros. Sin embargo, en este caso, echamos en falta la llave de estrella que suele incluir en otros disipadores para poder apretar los tornillos. En cuanto a ruido producido por el ventilador, aún funcionando al 100% de su capacidad no llegamos a notar que sea molesto, este es un aspecto que Noctua cuida mucho en todos los ventiladores que fabrica. Der Kühlkörper wurde seitens Noctua erwartungsgemäß gut verarbeitet und bietet in diesem Punkt keinen Anlass zu negativer Kritik. Damit stellt der Hersteller abermals unter Beweis, dass unabhängig von der Größe des CPU-Kühlers die Verarbeitungsqualität im Hause Noctua hoch gehalten wird. Uno de los aspectos a tener en cuenta es que Noctua especifica en su pagina web que el Noctua NH-L9i y el NH-L9a están diseñados para CPUs de hasta 65W de potencia térmica, aunque en caso de utilizar uno de mayor potencia tampoco pasa nada, aunque no tiene mucha lógica debido a que para este fin tenemos disipadores mejores e incluso más baratos. Para realizar la prueba se ha empleado un procesador 3770K que no es ni remotamente el idóneo pero ha aguantado de forma correcta los 77W. Aunque una vez lo probamos es imposible perder lo de vista, ya que la gran virtud de este disipador es que con 37 mm existen pocos disipadores con un perfil menor que este en el mercado y aun menos con la capacidad de que se encuentren diseñados para un consumo moderado y potencias térmicas limitadas. Las pruebas realizadas en idle y en full dejan un buen resultado, ademas hay que destacar su sonoridad, ya que apenas se escucha el disipador. Después de probar los modelos Noctua NH-L9i y Noctua NH-L9a hemos podido comprobar otra vez como esta marca sigue en su línea de calidad, los acabados y materiales son excelentes. El rendimiento térmico está en la línea de lo exigido a un producto así que como es lógico no está diseñado para realizar OC del procesador. En cuanto al nivel de sonoridad como hemos podido comprobar casi son imperceptibles en un uso normal y molestan muy poco cuando se les exige algo más. 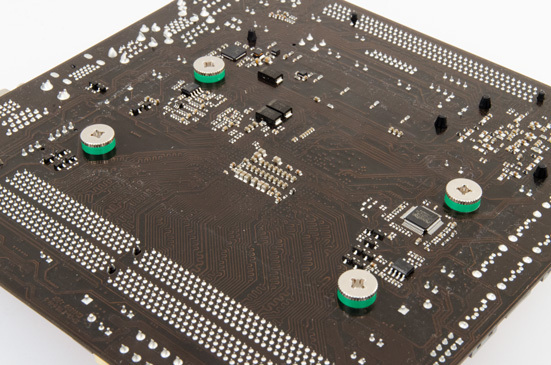 Can the cooler be used on mainboards where components on the rear side prevent the installation of the backplate? Yes, the cooler can be installed on such mainboards using the NM-APS3 plastic spacers as shown below. The NM-APS3 spacers have been included within the NH-L9a’s scope of delivery since April 2013. 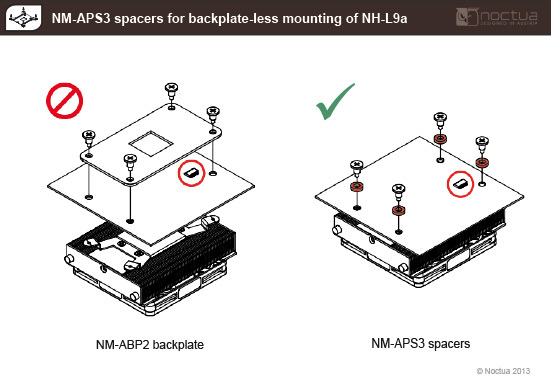 If your NH-L9a didn’t yet include the NM-APS3 spacers and if you would like to install the cooler on a mainboard where components on the rear side prevent the installation of the backplate, please contact our customer support. We will send you the NM-APS3 spacers free of charge if you provide a proof of purchase (scan, photo or electronic copy of the invoice) of both the cooler and the mainboard.